Vallejo was originally home to the Miwok, Suisunes, and other Patwin tribes. After being colonized by Spain, and later Mexico, the city (part of a large swatch of land) was granted to Mexican General Mariano Guadalupe Vallejo, prior to the Bear Flag Rebellion of 1946. The city is the largest in Solano County, with 115,942 residents (2010 Census), and is home to Six Flags Discovery Kingdom and the Mare Island Naval Shipyard. The city has several historic neighborhoods and landmarks, notably, Saint Vincent’s Hill Historic District, Vallejo Old City Historic District, and the Bay Terrace Subdivision – located within the Vallejo Heights Neighborhood – which was designed by architect George W. Kelham (a student of the architect of Golden Gate Park and Central Park). Vallejo promotes conserving natural resources and encourages a sustainable environment through reducing, reusing and recycling. Recology Vallejo provides residential and commercial garbage, recycling and yard waste collection for Vallejo residents. Subscription to garbage services is mandatory. Construction debris, electronic/universal waste, and certain types of unrecyclable glass, are not acceptable for recycling. 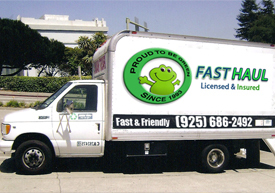 Fast Haul can deliver your unacceptable recyclables, HHW or propane tanks to the appropriate collection station.